As quick as a flash, it’s over. Four weeks of Frankfurt Spring School 2018 have come to an end. It’s been a busy time enriched with so many different topics, people and experiences. Now it’s time for our students to part ways, taking their newfound skills with them to develop and execute conservation projects in every corner of the globe. But what was it like to be a student of Frankfurt Spring School 2018? Do our students really feel prepared for a prestigious career in the conservation world? Of course, we have to ask them. Those that have followed this blog since its inception a month ago will remember Claudia Hermes and Zsófia Puskás, two of our dedicated students who took the time to tell us their hopes for Spring School and beyond. Before they leave Frankfurt, we sat down for one last conversation about their experiences. Just a month ago we were here talking about your expectations for Spring School 2018. Did you achieve all you were hoping to? Claudia: When I came here, I wanted to get to know how to run a conservation project. I now feel much more up to facing the challenges of every-day work in practical conservation. There are so many things you have to consider when you are a project leader, from developing the project to fundraising and human resource management. During the Spring School, we covered all these topics, and I gained really valuable insights into the how projects are managed. Zsófia: My expectation for the Spring School was for it to help me become more competent, which has been more than fulfilled. After finishing my university studies, I didn’t feel well prepared for entering the conservation job market. Although theoretical knowledge had been transferred, universities are research-oriented and give few insights into practical work done either by governmental or non-governmental organisations. Here in the Spring School I gained experience by actively applying the new techniques and skills required for practical work. Can you tell us about a single course that most impacted you during Spring School 2018, and tell us why? Claudia: I enjoyed all of the modules offered during the Spring School a lot, so I cannot even say which course I liked best. I think one of the most helpful modules was definitely the Project Planning workshop run by Martin Davies and Nick Folkard. Zsófia: I agree, the logical framework planning method helps you not just to set up the conservation project plan, but it is also useful for the communication and strategic plans. Claudia: The theory behind the LogFrames is so universal that it can be applied in many aspects of life – be it biodiversity conservation, structuring your Master’s thesis work or even planning a birthday party! But I also very much enjoyed the module on communication. I think that communication is a very powerful tool in conservation – if you know how to talk about it, you can reach so many people and increase the impact of your work considerably. Zsófia: I would also highlight the module on Human Resources. I especially liked the insight into experiences at different steps of the conservation career ladder: employer and employee. I also enjoyed the last day with the module of organisational development and strategies, where we learned how to clarify our missions and aims and how to plan the steps toward our goal. This is probably because I tend to be more structural in personality type and adopt an analytical social style, an introspection I gained regarding personal development in the modules of Social Styles and Workshop Facilitation. Can you each sum up how Spring School has changed your outlook on your future in conservation? Claudia: The Spring School was not only a fascinating experience, it also helped me a lot in clarifying what I want to do in the future. I’ve now managed to make up my mind about my career plans. During the Spring School, I got so much information on what skills are required to work in nature conservation, which was incredibly helpful. Apart from that, I met so many interesting people here who are doing great work in conservation projects around the world – it has been really inspiring! Zsófia: Since my bachelor studies I know that only answering scientific questions is not enough for me. That was the reason that I chose to study a master’s degree on wildlife management, which is more applied. I took some lectures in conservation but I wasn’t sure whether it is the future for me. The Spring School confirmed for me that this is the way I want to go, it’s given me so much motivation. 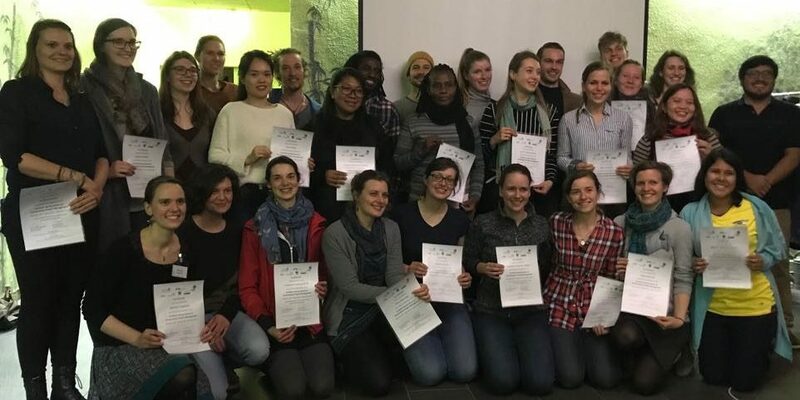 The Frankfurt Spring School on Conservation Project Management 2018 has been a truly enriching experience. We wish our students the best of luck for their futures, we can’t wait to see what they get up to! Immense thanks to each of our facilitators for their outstanding efforts, and of course to the Frankfurt Spring School’s partner organisations that make all of this possible. Don’t worry, this isn’t the end. Already we’re examining feedback, improving and innovating for 2019. Stay tuned in the coming months for more information. We hope you’ll join us again!